Capt. 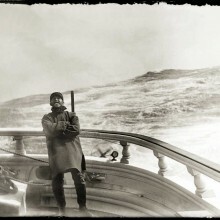 Lincoln A. Colcord is shown here standing at the taffrail of his ship STATE OF MAINE, while sailing off the Cape of Good Hope in 1900. The taffrail log (the ship’s speedometer) is spinning fast. Captain Colcord’s grin as he drives his ship at speed expresses the sentiments of any Down Easter captain under such conditions. His wife was supposedly less than happy with his grin in this photograph, as he did not have his teeth in the exposure was made. It is hard to imagine setting up a box camera on the deck of ship in seas as big as the ones looming behind the proud captain. It is harder still to imagine that it was his 13-year-old daughter Joanna behind the camera. The STATE OF MAINE was built in Newcastle in 1878 by Ebenezer Haggett for a consortium of Searsport captains who also owned two other Down Easters built by Haggett. Colcord came ashore in 1903 after the STATE OF MAINE was sold for a barge, but went back to sea as a steamship master in 1907. He died aboard the SS VIRGINIA in Bremerhaven in 1913. This is perhaps the most iconic photograph in the museum’s collections. It speaks plainly and grandly of what it meant to sail the high seas to distant lands. The museum’s founders were sea captains, and there is no doubt that the spirit represented here was what they wanted to preserve.